Marley and Me: What Was I THINKING??? Like I'd mentioned earlier, there is a base theater here which shows almost-first-run films. They show other stuff too (I saw "Goodfellas" the other day, "Scarface" is running at 2am Saturday morning). As for the first-runs, they're currently showing "The Wrestler", "The Day the Earth Stood Still", "Nights at Rodanthe", "Miracle at St. Anna", and "Marley & Me". Many of you know that I wanted to see "Marley & Me". I'm always game for cute movies about dogs. It played at 11am today, since my bedtime is 2pm it was perfect. I even had time for a run beforehand. Boy, watching that film was like watching a movie made about Dave and me. Okay, okay, kill the glamour of it all. Break it down to the storyline. Newlyweds, each getting along in their careers, decide to get a dog. Then a couple years go by, they decide to start a family (in Florida, no less, sound familiar?). When the second child comes along, Mom makes a conscious decision to stop working to raise the kids (again, sound familiar?). She goes through the exhaustion, the periods of bitterness and resentment of giving up her career for the family, etc. Dad is faced with relocating the family (sound familiar 6 times over?). The dog is there through all of that. He sleeps on the kids' bunk bed (sound familiar? ), the kids don't know life without the dog (sound familiar?). Anyway, while most people would cry at the end, I was in tears all through the movie, from them choosing the puppy all the way to the end (which I won't give away). I guess I was really missing my boys. All my boys. Dave, Howie, Jacob and Timmy. All of us girls in the theater cried, we all had to run to the bathroom afterwards to grab paper towels. I don't think I reacted that way to a movie since "My Dog Skip" (2000), which, incidentally, stars Luke Wilson. Owen (Luke's brother) was in "Marley and Me". Bottom line: I highly recommend the film, but bring a BOX of Kleenex. Perhaps I was better off waiting till I got home to see it. It wasn't until yesterday (5 days into my deployment) that I found signs of life other than us humans. I still haven't seen any animals, other than a security forces German shepherd. I hear there's a cat that lives among us at the facility I work at, but I haven't seen him yet. I was walking to the new fitness center on the base (I live next to the old one) and came across this patch of flora. Enjoy! 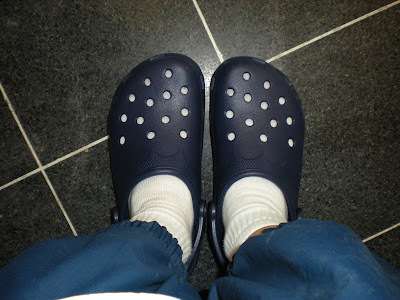 Okay, before I start my next story, let me show you my new Crocs! 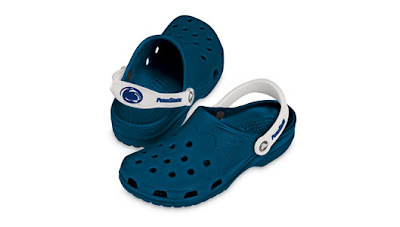 I guess Crocs is discontinuing their collegiate Crocs, since I could only find Penn State Crocs in their smallest adult sizes online. Oh well. The BX here had navy blue "Beach" Crocs, khaki "Professional" Crocs (no holes), and orange "Cayman" Crocs. It turned out they were shipped by mistake and were 1/2 price ($12). So I got a navy blue pair and I'm happy. I plan to order some PSU Jibbitz. Of course. It's about hydration. Water here is offered by the pallet-load in these water stations throughout the base. We help ourselves to what we need, whether it's a single bottle, or a 12-pack. Or several 12-packs. The company claims this water is from a "Well out from Qatar's desert from the depth of 70m under the ground. It includes all the necessary mineral factors which help in supporting the bones and suit all ages." I checked the label twice, that's what it says. Really. Anyway, these are the standard 1/2 liter bottles, like the Ozark, Zephyrhills, or other local water companies in the states. In my room, in the box of leftover stuff donated to the next occupant, there were about 6 boxes of assorted brands of "singles" of beverage mixes, such as by Kool Aid, Crystal Light and Hawaiian Punch. I think Gatorade makes them too. 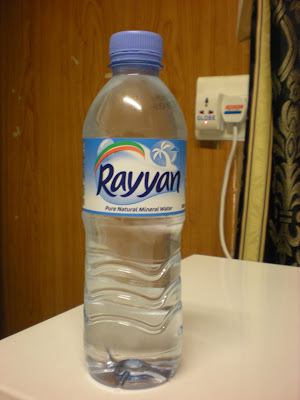 You get a single serving of beverage mix, you dump it into the bottle of water, shake it up, and you have instant FLAVOR for your Qatari water. I've decided these are pretty cool...if anyone's thinking of a cool care package item, I recommend these, preferably sugar-free. The dining halls carry Crystal Light tea and peach tea here already, so other flavors would be welcome. We're allowed to take 1 or 2 cans of soda out of the dining hall to enjoy later, which I usually do. I either take them to my desk at work, or else I keep them in my fridge and enjoy them later. A couple days ago, I was unloading two "Pepsi Diets" [sic] into my fridge and I dropped one. It fell to the floor, got a hole on the bottom edge and started spinning on the floor, spraying Pepsi Diet all over my dorm room! Remember, it's a small room, so before long, my floor and walls, along with my shoes, backpack and open fridge were covered in Pepsi Diet! UGH! I was able to wrestle the still-spraying can into the trash can to finish its fireworks show with about 1/3 of the soda still in the can. I had a few cleaning supplies, but what I lacked were rags, towels or sponges for cleaning. I happened across a towel stuffed up on the curtain rod, in place to further darken the room for us night-shift folks. I grabbed that and wiped up what I could. Good thing it was Pepsi DIET...no harm when it dried up. I picked up a couple of inexpensive washcloths at the BX today with my Crocs...expressly for such emergencies. Coming soon: they took my extra bunk beds this morning! I've finished rearranging the furniture and am beginning to get comfortable! Also, I found signs of life here -- my photo album of desert foliage! So my Rainbow flip flops won't cut it except for shower shoes. This is actually not a huge deal for me, since I don't mind putting on my running shoes to walk around the base in my PT clothes when I'm off duty. Well, it turns out that recently they started allowing Crocs, and they don't have to be just black. There are a FEW other colors allowed, such as sand, brown, white (which will turn into sand colored in 2 seconds)...and blue. I have my eye on a blue pair that I might order, since my pink mary janes wouldn't have cut it. I want to verify the colors and whether the emblems are allowed before I get them, though -- just because I've seen AF Academy Crocs around doesn't necessarily mean they're allowed. Coming soon: stories about Kool Aid Singles and a can of "Pepsi Diet". This one is about the the incredible support structure at this base. Permanant Air Force bases have an assortment of "services": a fitness center, lounge/bar/club, library, laundry/dry cleaners, a finance office, movie theater, food service, chapel services, and medical services. They usually operate at hours similar to civilian versions. All of that stuff has been made available to us here 22-24 hours per day, 7 days per week! Since I'm working nights, it's fascinating knowing that I can grab a Starbucks coffee* at 11pm, check out a book from the library at 6am, cash a check at 3am, or see "Marley and Me" at the theater at 8am! The fitness centers are open around the clock, laundry drop off/pick up is available around the clock and many of the other services are closed 1-2 hours per day just for cleaning. I've attempted the webcam thing with the family just once so far, my work hours have made it hard to merry up with Dave's and the boys' school and sleep schedules, but I think that's going to improve as my schedule settles in better. We have a couple of prime opportunities on weekends...when my battery arrives it should be better. I can plant myself near the WiFi source and get better signals. When I was younger I used to balk at the limited hours other base agencies would have and the premium placed on morale services available to the troops. Remember, I'm a weatherman...and weather stops for no mission! ...and because of it, the best morale of all the services and (in my opinion) the most fortitude to work their tails off when it comes time to do so! Like here at this base, right now! The last time I was in a hostile fire zone, I was a 1st Lieutenant. I was working 16 hour days -- and expected the same from everyone around me and didn't think it was fair that I had to work 16 hours per day, and others on the base only had to work 12 hour days. I'm now older and I wiser, I guess, and since I've arrived I've been constantly processing my information as a leader instead of a follower. I'm watching the younger troops' well being like a hawk and constantly asking if they're happy with the food and dorms, if they're getting enough sleep, can they communicate with their families enough, and is there anything more they'd need in terms of morale items? Yes, even in the 4-5 days I've been here! That being said, here's a link to a photo album I've started that covers some of the morale and quality of life items we're provided over here. You also can enjoy the stunning scenery here. We have strict restrictions on what we can/can't photograph: no operational stuff, such as aircraft or buildings that contain mission-related stuff and no foreigners without their permission. Some of the things I'd want to photograph often have foreigners around so I'm avoiding it. *Yes, you read right: We have Starbucks here. See the photo album if you don't believe me! YUM! No more iPhone transmissions from Southwest Asia! I used my iPhone a few times since I’ve been here. I used it quite a bit en route, uploading pictures and chatting on Facebook from Italy. My phone will officially stay in “airplane mode” for the rest of my time here! So it’s essentially an iPod touch, still quite useful to me. I can still access my tunes, my one movie (Star Wars the Clone Wars), and my notes, contact lists and games. I just checked my AT&T bill and did the math: I’ve done 5.07MB (5070KB) of data transmission via the iPhone on this trip, at $0.0195 per KB = $98.87!!!! I knew this was coming…I received a text message in Germany, Italy and my location here, each from the respective cell phone companies (Vodaphone, Voda-It, the one here) telling me the data transmission charges. My phone can hop on wireless here when it can find it, but as soon as the wireless drops, the cell phone network picks up the slack and suddenly the charges accrue. Can’t wait for that first paycheck from this trip to cover those charges! This is "The Bra", the nickname for the tent covering the central patio in our base's living area. I don't think I need to explain any more. The base gym, BX, finance office, library, media center and WiFi hotspot (with which I can do these blog posts) all are near here. Anyway, to give you an idea of the dust here, note the different colors to the "bra cups". Yesterday I was kicked out of my spot under the right side of the tent because workers were hoisted up to the top of the tent to scrub it. The right side is scrubbed, the left side, obviously, isn't. I don't know how often they do this...I'll keep you posted. It isn't super-dusty here, but there isn't a lick of foliage anywhere at all! No grass, no trees, NOTHING. All sand and rocks. For those who know how much I love to garden, you could imagine my disdain! This is what greeted me when I tried to use Google.com for the first time this morning. 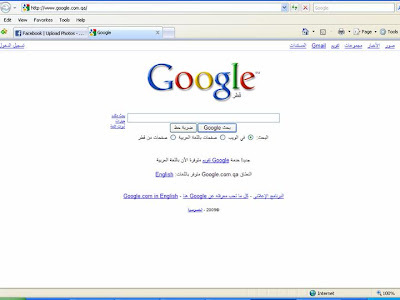 I did a screen capture before immediately clicking that "Google.com in English" link in the lower left. Several of my web pages are doing this, my ads on Facebook are for goods and services near my location. Some in English, some in Arabic.